Access the Admin Menu by scrolling your mouse over the gears icon in the left sidebar. Then, in the E-Learning section, select the Courses item. To upload an AICC package in Docebo, select a previously created course from the list of courses on the Main Courses page. Make sure you are subscribed to the course as a Superadmin or Instructor. 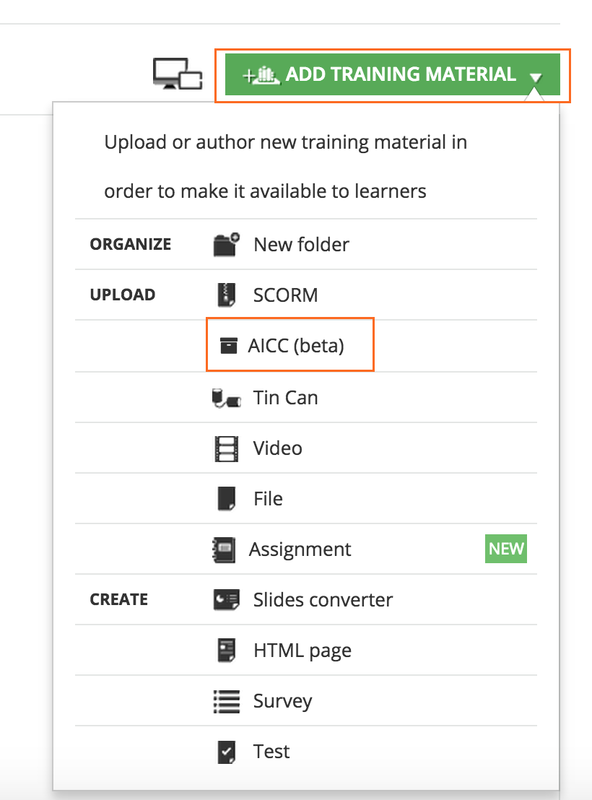 Once you have opened the Training Materials page, select the Add Training Material button, then select AICC from the dropdown menu. Full screen opens the object in full screen mode. The configuration files of the AICC package must be in the root of the ZIP file. If you plan to also run this object with a tablet device or smartphone using Docebo’s Mobile App, you can also choose how users will view the material. Finally, move to the Additional Info tab to add a short description of the text, then select or upload a thumbnail. When you’re finished, press Save Changes. If the file format is correct, the learning object will be uploaded as new course material, and a message will be displayed on the top left of the page.